Passing the Chemistry Placement Exam allows you to bypass the chemistry prerequisites for both CHEM-C102 and CHEM-C105. A registration fee of about $30, payable directly at the ALEKS website, gives you 90-day access to ALEKS Chemistry which hosts the exam. You are first presented with an Initial Knowledge Check which covers about 130 fundamental chemistry topics with questions that adapt to the knowledge and abilities of each student. If you score 51% or higher on the Initial Knowledge Check then you have passed the Chemistry Placement Exam and may discontinue use of ALEKS Chemistry. If you score less than 51% on the Initial Knowledge Check then you may take a Retest approximately once every two weeks when you feel you are ready, subject to the 90-day access limit. Regardless of you how perform on the Initial Knowledge Check you may continue within ALEKS Chemistry to review, practice, and learn material from the topics covered on the exam. 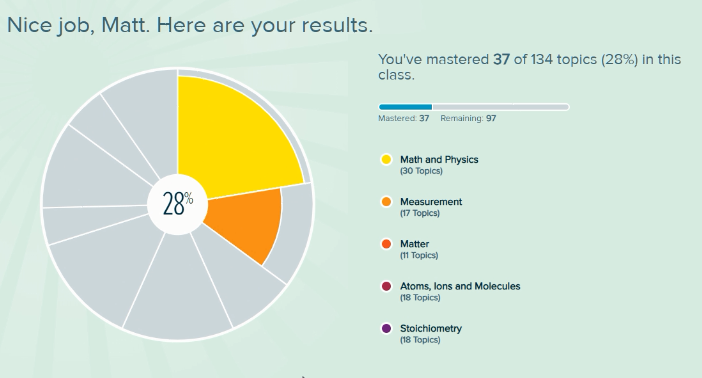 As you progress through ALEKS Chemistry, the system reports how many topics you have learned and mastered. Successful practice leads to topics learned. Periodic partial Knowledge Checks are automatically offered after a sufficient number of topics have been learned and cover only those topics recently learned; success promotes those recent topics from a learned status to mastered status. None of this progress is official; these checks are only for you to gauge your ability to pass an upcoming Retest. A Retest is essentially a repeat of the Initial Knowledge Check. Your 90-day subscription to ALEKS Chemistry is divided into many time blocks (usually two-week periods) and you may take one Retest at any time during each time block. Failure to score 51% or higher on a Retest means that you must wait for the next time block for another Retest; however, you may practice freely within ALEKS at any time (except during a Retest or the Initial Knowledge Check). It is okay to skip a Retest and take the next one instead. Once you score 51% or higher on a Retest, then you may discontinue use of ALEKS Chemistry. One purpose of the Chemistry Placement Exam is to give an accurate measure of your current skills so that you will placed into a course where you will have the best opportunity to be successful. Therefore, while you are taking the Initial Knowledge Check and Retest, it is important that you do not consult with any other source for help (friends, family, internet searches, textbooks, etc.). Use of outside resources may result in you being placed into a course for which you are not prepared. However, another purpose of ALEKS Chemistry is to provide you with a way to refresh your previous knowledge and skills – and even to learn some chemistry on your own. For this endeavor, you are advised to use all resources available to you to best learn and practice as you prepare for your Retest. Scores for this test are regularly recorded in your One.IU account in the test credits section as SBCHM at the middle and end of each month. Passing scores on an Initial Knowledge Check or Retest must be made one week before classes begin to allow time to process the scores. Scores received after the deadline will allow for registration in the following term. You will need your IU username and student identification number to identify you as an IU student during this process. For help during this registration process, please contact ALEKS Customer Support by visiting http://support.aleks.com. Go to https://www.aleks.com and select SIGN UP NOW! under the Registered Users box. Enter the 10-character Class Code CCX4T-3DULU and select Continue. Verify your enrollment information (Class = Chemistry Placement Exam, Instructor = Matt Marmorino, Institute = IU South Bend) to make sure you are enrolling in the correct class. If the information is incorrect, check your class code and select Cancel to return to the previous page. If your information is correct, select the Confirm button. Indicate whether you have used ALEKS Chemistry before and select the Continue button. Most students will select NO. If you are unsure, please select NO. If you have used ALEKS Chemistry before (not ALEKS Math), you will be prompted to enter your existing login and password. You can retrieve your login information by selecting the “I forgot my login information” link. If this is your first time using ALEKS Chemistry, then you will be asked to complete registration to create an ALEKS account. A confirmation email will be sent to the email you provide when you are done. Please fill in the page using your full name, IU email address, and IU student identification number to properly identify you as an IU student. Be sure to record your ALEKS USERNAME and ALEKS PASSWORD. These are NOT the same as your IU username and password. Finally you must provide an access code to complete registration. You should not already have an ALEKS access code so select No, I need to purchase an access code and select Continue. The price is around $30 for “ALEKS Introduction to Chemistry (90 Days)”. Provide the information requested and complete your order. Registration is now complete. You may log off and return to ALEKS Chemistry at a later time starting with step (1) in the next section … or continue right now in ALEKS Chemistry starting at step (2) in the next section. Sign in at https://www.aleks.com using your ALEKS username and ALEKSpassword. You will be greeted with a few welcoming windows before you are directed to the main menu. After a few clicks of the mouse on some more tabs you will be directed to the Take the Tools Tutorial. Click GET STARTED and proceed through the tutorial to familiarize yourself with the testing environment. Once you have passed the tutorial you may take the Initial Knowledge Check. This is your first chance to bypass the prerequisites for both CHEM-C 102 and CHEM-C 105. If you are ready to begin, please click START KNOWLEDGE CHECK. At the end of the Knowledge Check, you’ll be shown a results screen indicating how many topics out of the total number that you have mastered. You must master 51% or more of the topics to pass the Chemistry Placement Exam. There is no special message to indicate whether you have passed the Chemistry Placement Exam based on the Initial Knowledge Check. If you mastered 51% or more of the topics, then you have passed the Chemistry Placement Exam and may discontinue use of ALEKS Chemistry. If you mastered 50% or fewer of the topics, then you have not passed the Chemistry Placement Exam and you may wish to continue using ALEKS Chemistry to take a Retest later. You will see an image like the one below when you finish the Initial Knowledge Check. Although the favorable message “Nice job, Matt” is displayed in the image below, a score of 28% is not sufficient to pass the exam. This student can use ALEKS Chemistry to review the topics he has not mastered before taking a Retest. To continue using ALEKS Chemistry to learn and review topics to prepare for a Retest (or just for the sake of learning), please follow the commands that pop up on the screen after the report of the results from your Initial Knowledge Check. Eventually ALEKS Chemistry will take to you the Learn mode. Click on the menu icon (º) at the top left of the screen to reveal a menu. Your screen should now look mostly like the image below except that colored boxes have been added here to highlight certain sections. The small green box is the menu button which shows/hides the vertical menu on the left of the screen. The two items highlighted in red boxes show the same information: a record of your learning progress. Immediately after the Initial Knowledge Check this data shows that the student scored a 28% on the Chemistry Placement Exam (mastered 37 of 134 topics). Thus the student did not pass and should take a Retest after reviewing and learning more material. Had the student mastered 68 (or higher) of 134 topics then the student would have passed the exam with a score of 51% (or higher). That student would be done. As you learn and practice within the ALEKS system, the number of mastered, learned, and remaining topics in the top-right red box will change, as will your Class Progress in the other red box. These numbers are NOT official once they change from their starting values. However they do serve as an indicator of your knowledge and skill. Once you have mastered 68+ topics (shown in the top-right red box or under Class Progress in the bottom-left red box), then you are ready for a Retest. Please note that the due date under “Class Progress” in the lower-left red box is meaningless; unfortunately, it cannot be removed from the ALEKS Chemistry website. The numbered parts of the menu in the screen image are discussed below. This is where you learn and practice topics that you have not yet “mastered”. There is lots of textbook-like information available here if you get stuck on a question or wish to study material. You can review mastered topics here. This is where you access your Retest. You have multiple opportunities for a Retest. This is where you check your Retest grades. A score of 51% or higher on any Retest means you are done. This is like a chemistry encyclopedia.